public API in org.testng and the implementations are in org.testng.private. on internal API’s (com.sun. *) or avoiding J2ME proprietary API’s (com.nokia.*). methods from superclasses. Very convenient. Eclipse will look up the corresponding string in the resource bundle. I attended NetBeans Day yesterday, which started with a presentation on Looking Glass. Of course, Looking Glass has nothing to do with NetBeans and it was merely a way for Sun to showcase their technology, even though Hideya did mention NetBeans for twenty seconds at the beginning of his presentation (“we use NetBeans for development”). Looking Glass looks as good now as it did one year ago, and just as useless. I thought by now we had established that 3D desktops are very hard to use on a 2D screen, but it’s a lesson Sun just doesn’t seem to want to learn. What really worries me is that I didn’t even see anything new compared to last year, but the most troubling part was that even the demo person was sometimes confused during the show, picking the wrong titlebar or looking for his own windows. Don’t get me wrong: Looking Glass is a good technology and I hope Sun keeps working on it, but please don’t try to sell it as the Next Big Thing in desktops and usability, because it’s neither of these. Rick Ross was next, and after his usual diatribe on how big JavaLobby (the name, not just the Web site) is, he proceeded on giving his usual presentation on communities and how important IDE’s are. Next came Jonathan Schwartz, unshaved and unprepared, but winging it with ease. I am a bit tired of his propaganda spiel but I have to give him credit: he always looks and sounds good on stage, so it’s always entertaining to listen to him as long as you can wade through the Sun party line hammering. And finally, the NetBeans demo started. The first twenty minutes were spent demonstrating the editor, with features such as “turning all words to uppercase and back to lower case with just three keys” and “extracting a method” or “splitting an editor”. The entire demo was just a painful rehash of every single feature that every IDE (or even text editors) on the planet already has. If you are trying to win over an entire crowd devoted to Eclipse and IDEA (which was pretty much the case based on the various questions and conversations around me as the NetBeans demo was unfolding), you need to do better than “we do the same as the competition”. You need to show what you do different and what you do better. And of course, emphasize what you do that nobody else does (more on this below). The staging of the demo was also horrible: one person was manipulating and another one was talking. “So now we are going to talk about… [look at the big screen] … [look at coworker, exchange a few hushed words] ah right! Code completion!”. Do you really need to have two people on stage telling each other what to do? And I’ll gloss over the fact that the speaker started the demo by asking how many people read his blog… Seriously. You can’t find a better way to embarrass yourself in public (and a hint to the speaker: check your logs). Throughout the demo, the presenter was asked quite a few questions by the audience, and most of the time, he would just dismiss them and say “I don’t know, I’m just the presenter, I didn’t develop this thing”. Well, if you can’t answer the questions, you shouldn’t be on stage in the first place and you are guaranteed that it’s a frustrated crowed that will walk out of your presentation, not a wowed one. Next came a profiler demo (a lot of graphics but no real demonstration of solving a hard problem, and not much that I haven’t seen in OptimizeIt or JProfiler). Followed by… a JXTA demo. Yes, seriously. JXTA. Now there’s a differentiating factor, alright. You can be sure that nobody besides Sun will ever show this. But the real reason why I was there was for Matisse. I have worked with GUI builders since the early 90’s (yes, you read that right, circa 1990) and by now, I have a pretty good idea on what makes a good builder. What does the generated code look like?. The audience asked several times for this and eventually, the demo person relented. The code looks pretty big but doesn’t seem too bad. How tweakable is it? Not surprisingly, the code has big warning comments saying “you shouldn’t modify this or that portion”. There is a very elegant way to generate code and still make it easy for users to add their own logic that won’t be erased by reverse engineering: ask user to instantiate subclasses of the code you generate. What is the layout manager? Can it be changed? It’s called NaturalLayoutManager. It’s not part of Swing, it’s a brand new one, and they are talking to the Swing team to have it part of the JDK, which should happen in late 2006. Can you reuse your GUI’s ? This is by far the most ignored feature in GUI builders of all times, and the reason why they are so little used in general. Here is the deal: creating a nice GUI is just the beginning. Very often, I create windows with abstract methods and even abstract widgets in them. Then I want to be able to subclass them and alter them slightly (“I want the exact same UI but with a checkbox instead of a text field here”). Sometimes, I also want to build part of my GUI dynamically, and I can’t do that in the builder because I don’t know yet what widgets will be in this area. No builder has ever understood this problem and as a result, I have always ended up writing all my UI’s by hand. You just can’t take OO practices away from developers, they will hate you for that. How does code binding and reverse engineering work? No idea on how Matisse works there, there was no demo on callbacks or code insertion. There are also very important features that still don’t seem to be implemented yet: JUnit plug-in, Subvsersion support and, more importantly, global search. This is a feature I couldn’t do without, and I’m not just talking about text searches through a project, but also Java searches (“all places where this method is overridden”, etc…). Now I have to say there is at least one thing that I liked in this entire presentation: the collaboration plug-in. With this, you can have one of your coworkers see what you are seeing and even take over your editing or compiling. This is very neat and I hope that Eclipse and IntelliJ will follow suit and implement it as well. But for all the rest, the demo was a very poor illustration of all the hard work the NetBeans team has been putting into their product this past year. They deserve much better. Basically every e-mail that I’ve ever sent has been looked at by something like 30 or 40 lawyers to see if there’s any way it can be misconstrued. There are three kinds of meetings at Microsoft: where it’s a free-for-all and you can do whatever you want; where the people at the table have to pay attention but the others don’t (if you sit in a chair in back, that’s a signal that you’re going to just sort of be paying half attention); and meetings where we want total attention. The default really is: If you’re sitting at the table, you’re supposed to focus on what’s going on. But e-mail right now gets used for things where it’s not perfect. If you have attachments going back and forth with lots of different versions of a document, that’s crazy. It’s interesting to see how full circle we’ve come with attachments. When email started getting reasonably popular in the early 90’s, several standards competed to address the need to exchange binary files. The first attempts were quite awkward (uuencode) and became more sophisticated with time (better binary encoding and MIME types). Attachments work very well with email now, regardless of your email client, but it’s reaching a point where, as Bill Gates puts it, it’s sometime being misused. Email is fine when you are exchanging read-only documents, but clearly not optimal when the various recipients are expected to make modifications to the document and resend it to the entire list. Time will tell if Microsoft’s solution will find its way on our desks, but there is clearly a big market for this kind of functionality, that even a successful product such as Lotus Notes hasn’t filled to far. At any rate, read the interview, it’s well worth it. change and the next version (2.4, due out soon) will include the new naming. a small set of factory methods might be a bit overkill. a mistake – namely, that you forgot something. them can attest to this. richness of interfaces that extend each other is not as obvious. I+ctrl+space (or whatever your favourite IDE uses). concrete classes with syntactic conventions is useful, and the rest is details. This is the sure way to DLL hell… Not sure I want to go there. look up a factory to create it. Adding numbers to an existing interface is a sure sign of bad design. have a pretty good track record of producing excellent backward compatibility. Maybe there’s something to learn from that? What happens when you get to I*4 or I*5? Who the hell even knows? added in interfaces that receive a brand new name). totally sure that the interface is needed. then, you are no longer doing the "simplest thing that could possibly work". Cedric, can you offer your opinion on this w/ regard to Generics? CVS depot and Alexandru and I took a quick look there. make more sense than trying to cram test information into method names. while TestNG lets you specify more than one). 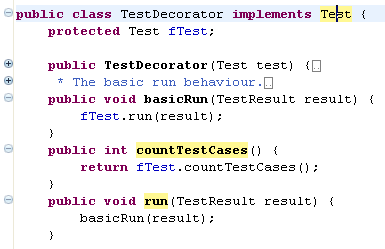 as an attribute of @Test in TestNG (e.g. @Test(enabled = false)). called… I don’t know, junit.xml?). see JUnit follow the same path. list of the various features offered by JUnit 4 with his own comments. doesn’t belong to a unit-testing framework anyway). Development… makes you wonder, uh? There is still no separation of static and dynamic models. the JUnit team seems to have decided to work behind closed doors on this. will be coming out of stealth mode and discuss it publicly soon. Artima just published an excellent interview with Erich Gamma which I strongly recommend to anyone interested in writing software for the long run. Erich makes a great job at explaining the power of interfaces while reminding that abstract classes can sometimes be useful as well. Since changing interfaces breaks clients you should consider them as immutable once you’ve published them. As a consequence when adding a new method to an interface you have to do so in a separate interface. In Eclipse we take API stability seriously and for this reason you will find so called I*2 interfaces like IMarkerResolution2 or IWorkbenchPart2 in our APIs. First of all, notice that they are prefixing interfaces with "I" which, if you are a regular reader of this blog, is a convention that I like a lot and use everywhere. Once you start realizing the importance of interfaces, you want to find a way to read a piece of code and immediately spot whenever a concrete class is being used instead of an interface. This convention goes a long way toward this goal and in my eyes, a piece of code is completely "pure" if all the type names it uses start with I. More generally, this technique is a lesson that Java programmers have been very reluctant to learn. I am not sure where this resistance comes from but it might have something to do with the fact that this conventionn was popularized by Microsoft in the Component Object Model way back in 1995. What the article doesn’t say is how exactly you can leverage this pattern to actually write reusable code. Note: I initially used the example of decaf coffee for this but it occurred to me that this would be an implementation change, and not an interface modification. Milk makes more sense because we are adding a functionality that hadn’t been anticipated by the first version of this interface. As you can see, this is quite straightforward. And it probably makes you cringe a little… After all, weren’t you warned over and over again to avoid instanceof as much as possible, and more generally, that your code should not rely on the existence or implementation of subclasses? This advice still stands, but like all advice, it has exceptions. And future evolution as illustrated in the snippet above is a high enough reward that you should consider this approach when writing Truly Reusable Code. * no such object can be found. There is a lot more to say about this interview and I don’t want this post to become too lengthy, so I’ll just wrap up for now by observing that this philosophy is quite at odds with what XP is trying to achieve, which is a nutshell is "Do the simplest thing that can possibly work". The XP philosophy is way too extreme for me (hence its name, I suppose) and I have always stayed clear of it as an absolute rule. The approach explained above gives you a good counterpoint to this philosophy, and armed with these two tools, you will be able to make the right decision on how extensible you want your code to be. you are not being locked in to someone else’s proprietary implementation. a different AWT for every operating system. of the desktops out there). use before you can start the download (which is an executable). reimplemented from scratch in Java by Sun. The support for native integration in Swing is still very primitive. about what makes NetBeans different from Eclipse as opposed to "better". Just let your users and readers judge, they will respect you more for it. This is partial completion of types. Notice that I typed "PT"
useful (and this functionality replaces a plug-in I mentioned in an earlier blog).